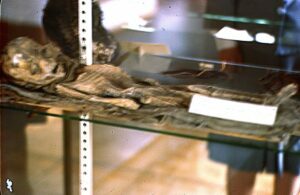 The Roswell Slide – This is the highest resolution that I have found, as of March 6, 2015. Why have they not released a super high resolution scan of the Kodachrome slide for analysis? Click here for the highest resolution available. 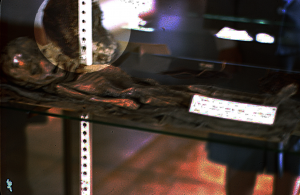 For months, the world has waited for the release of alleged “Roswell Alien” slides that were teased in 2014. Of course highly controversial, these slides were believed to have been the “Smoking Gun” – with irrefutable proof aliens exist and have visited Earth. After months of waiting, researchers attached to this story (which include Donald Schmitt, Tom Carey, Richard Dolan, and Jaime Maussan) decided that May 5, 2015, or Cinco de Mayo, was the right day to reveal to the world what was on these slides. Well, that is, if you wanted to fork over some money to watch the reveal. Curious onlookers paid $20 to login to view the presentation, which quickly became a joke to many who paid. 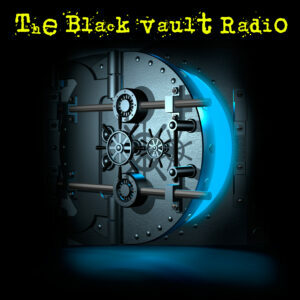 Social media roared with the fact that many paid money, and saw a screen with an error, as the stream was not working. Others who did get in, waited for the moment they finally revealed the slide. But, as many put it, it was “underwhelming” at best. To further prove this point, I did some analysis on the highest resolution slide I could find. First, I highlighted what appears to be a gorilla or ape head, in the same case as the “alien.” Would this make any sense whatsoever? It would in a museum — not if this was an alien. In the background of the focal point of the slide, you see, what appears to be, an ape or gorilla like head. This appears to be in the same case as the “alien” which further proves this is a photo taken at a museum, and not a photo of an alien. In addition, it should be said that the original film should have much more detail than what was released to the public. 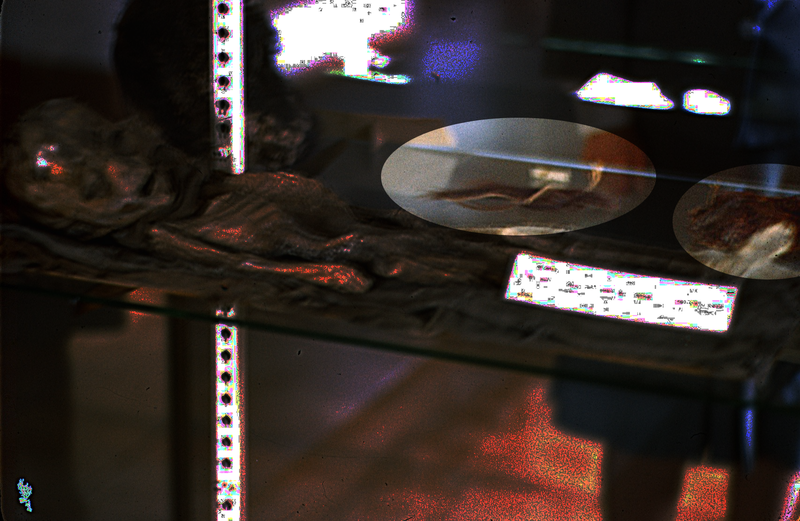 If they were to release the higher resolution photo, my guess is you would see additional details, and possibly even the words, on the piece of paper resting near the “alien.” This would, in my opinion, be the details of what was in the museum case. By adjusting the slide’s contrast and brightness, you can see there are, what appears to be, writing of some sort on the card. Although it is completely illegible at the resolution currently released, a higher detailed scan could reveal the writing. Is this why a higher detailed image was not released? Some claim this “card” is not a card, but rather, a reflection of an overhead light. Clicking on the two photos above, you can see the distinction between what are obviously reflections, and the “card”. With the analysis, you can also see, what appears to be, details that resemble text on the “card” while the more obvious reflection stay solid white in the center. Further, the following image clearly shows (and it can be seen with NO adjustments on the photo whatsoever) that the ape-like head in the same case, also has a similar card. In front of the Gorilla or Ape-like head in the case, you find another “card”. This, which is seen with no adjustments on the original photo, clearly shows that this is a card sitting on a stand. These are common in museums to outline what you are looking at. This photo was tweeted out by Jaime Maussan, and he did so at approximately 12:00 noon on 5/6/2015. 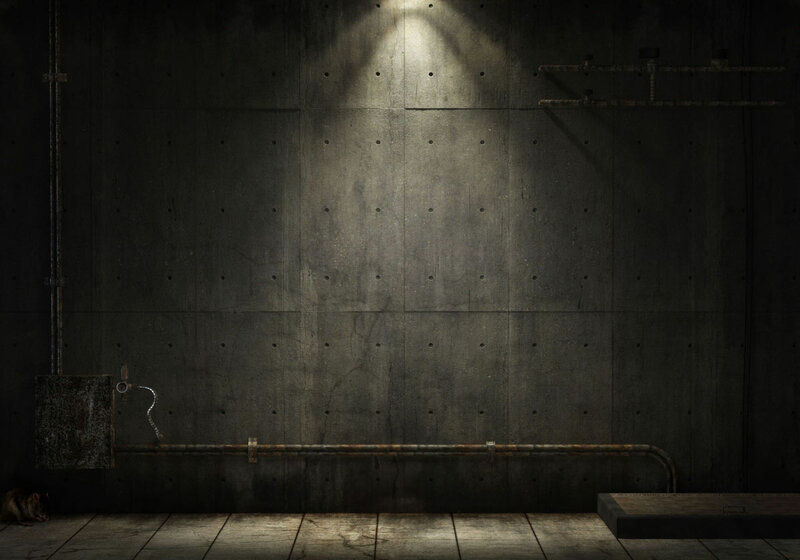 This is the full resolution of what he tweeted, incredibly low resolution. However, what can be seen is that the debated “card” in front of the alien, is, in fact, an information card just like you would see in a museum. Another detail overshadowed by the “alien” focal point of the slide, is the other person, on the other side of the glass. They appear to be standing there, just like another observer at a museum, looking at the other items in the case. I will let a fashion expert figure out the time frame of their clothing, but it does not have feeling of a secret installation housing an alien body. Adjusting the brightness and cropping the slide to highlight the person in the background, reveals a common scenario of anyone taking a photo in a museum. You want to get a good photo, and yet, there is always someone on the other side of the glass looking in. And lastly, looking at the cabinet that houses the “alien” reveals there are other objects, just like a museum. 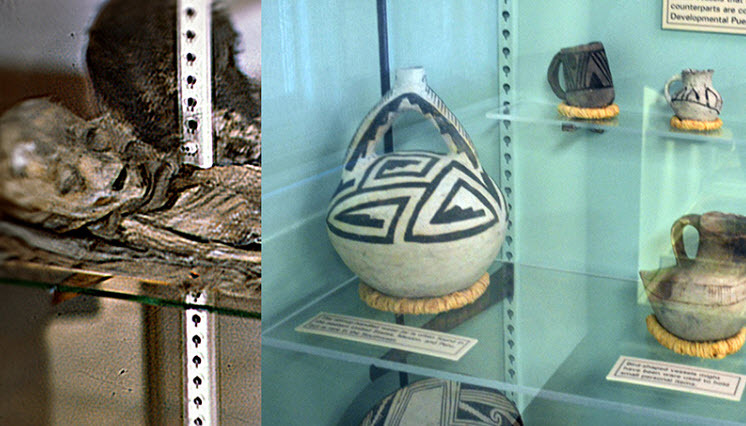 Looking in the case, you see other items “on display.” These items do not appear to be “alien related” in ANY fashion, and rather, look like other artifacts on display. 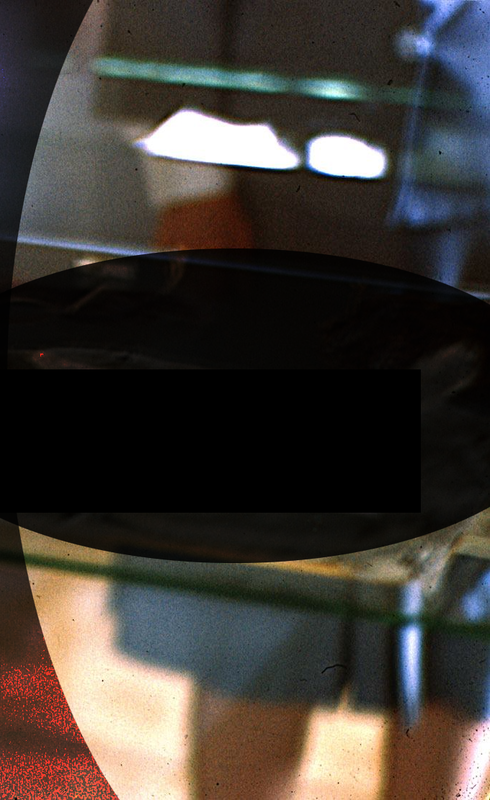 You can see the object in the center of the frame, highlighted in this photo, also has a small ‘tag’ that also probably reveals what any museum-goer is looking at. 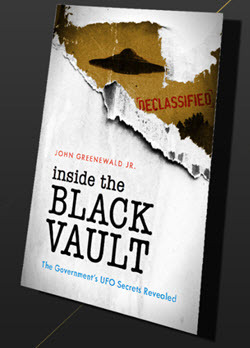 It is the opinion of The Black Vault that evidence of alien life, should it actually exist, should be released to the world, for free, without hesitation. To build up hype, sell tickets for months, then release a single, grainy, photo claiming evidence of extraterrestrials, is evidence enough for me this was nothing more than a scam. That, and if you want to know more, there is a “movie” coming out which we all will undoubtedly have to pay even more to see. When I woke up the morning of May 6, 2015, I expected to at least see 10, maybe 20, maybe even 50 headlines about this. What did I see? At 8am in the morning, well after the first news cycle… there were about 3. And those articles ripped apart this story, and profiled it as the joke it was. 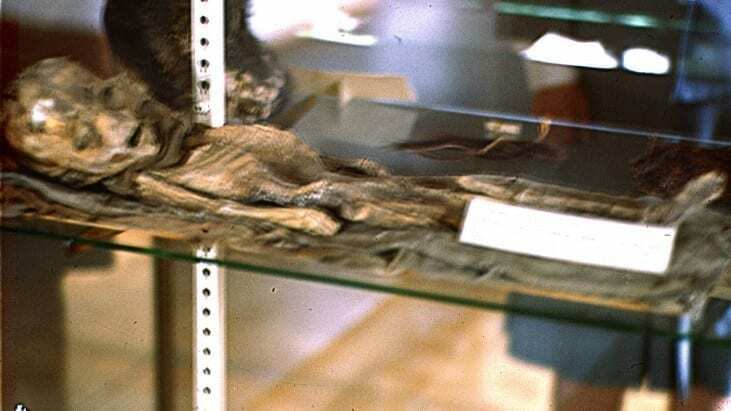 Two photographs of a “dead alien” were unveiled at a big money event last night – and immediately dismissed as fake. A series of ‘UFOlogists’ appeared at the Be Witness meeting last night to reveal images of an extraterrestrial who supposedly crashed to Earth during the infamous Roswell incident in 1947. The images were found by former journalist Adam Dew, who reportedly turned down interviews with magazines that wanted to cover the story because “they were not offering any compensation”. He claimed to have taken steps to verify the pair of alien snaps and said Kodak experts had dated the film to 1947. But the rest of the world has not had the chance to test the rigour of his methods, because high resolution images of the alien are not yet available. They are likely to be sold through his production company Dew Media alongside a documentary about the discovery of the slides. Nick Pope, a researcher who headed up a UFO investigation wing at the UK Ministry of Defence, told Mirror Online he was “underwhelmed”. “It could be a model, or it could simply be a fake image, dressed up to look like a Forties slide,” he said. Others took to social networks, and quickly were able to find nearly identical looking ‘bodies’ right here from human civilizations. This, even further, supports the theory this is nothing more than a museum artifact. 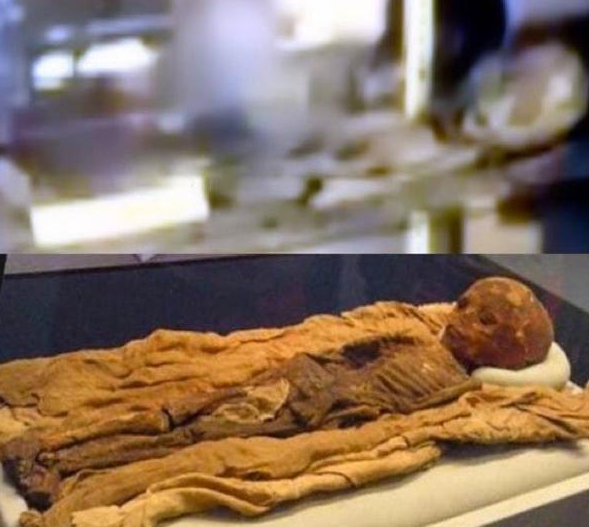 Thebes mummy found 1856, transferred to US Smithsonian in 1956 as compared to the “Roswell Alien”. Earth’s, scratch that, HUMANity’s history is full of relics and artifacts that look nearly identical to the “alien” revealed to us on Cinco de Mayo. The bottom line is, it does not matter if those that are skeptical on this, find a photo or video or a resting place of the EXACT mummy, or child, or whatever is depicted in this photo. The burden of proof does NOT fall on us that have questions on what is being dangled in front of us. 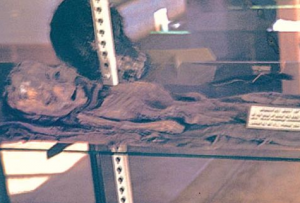 There is OVERWHELMINGLY enough evidence to PROVE that there are nearly identical looking bodies here on Earth, and have been for a long time. So, I think the ball is in the court of those behind this to give something, anything, of value that proves otherwise. If not, it’s time to move on. Is it the same? Probably not, but it’s darn near identical. 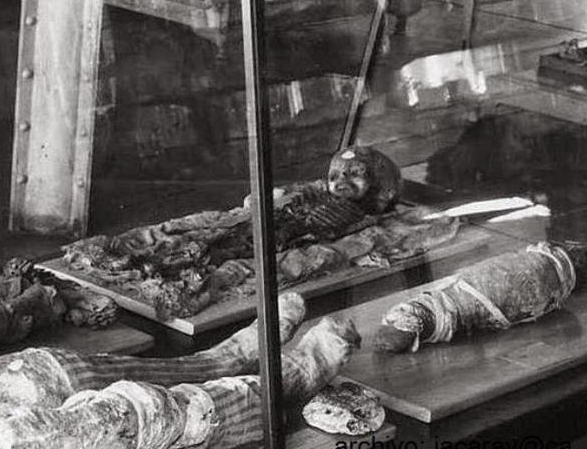 The decomposition of the body, the state of the skin, color, etc., is nearly identical to this Egyptian mummy. The wrapping underneath, looks nearly identical, with the same color, and a similar looking material to this Egyptian mummy. The FOLDING of the wrapping underneath, is nearly identical to that of what you would see in a museum, like this Egyptian mummy, unwrapped and on display. The burden of proof is seemingly on those, skeptical, of this case. Unfortunately, it just doesn’t work like that. The burden of proof does not lie on those skeptical, but rather, on those making the claim. The only one who has spoken to us (that I’ve seen at this point) about it, was Mr. Richard Dolan. And his underlying statement, was he isn’t convinced it’s alien, just that it warranted additional investigation. If he was there, and he sat through the 5+ hours of ‘testimony’ and ‘evidence’, and he met with the ‘scientists’ that spoke, and he saw, first hand, the photos, etc., and he isn’t convinced? Then simply put: the evidence isn’t there. That means – those promoting this and “selling tickets to the sideshow” at this point, have a lot more work cut out for them. The silence, is deafening. Although part of me wants to be frustrated at being ignored with my questions now for months (I posted questions well before the reveal), why should any of us give it the time of day at this point? I believe my questions, and comments, and observations (which are shared by many), deserve an answer and should be addressed. If not directed at me, direct them at someone so answers can be given. If you make us wait for the DVD, or book, or whatever to reveal another nugget – my guess a mass boycott is coming, and sales will be virtually nothing. Although the fate of this field does not rely on their evidence, and it will continue on for years to come, the silence, lack of evidence to this grandiose claim, and unwillingness to address concerns make it a heck of a lot harder for us trying to make a real difference in this field. UPDATE: 5/11/2015 – Does this put the entire case to rest as a case of mis-identity? 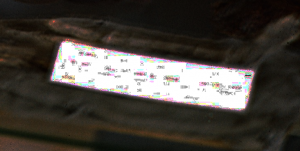 After a “deblur” process is run on the high resolution version of the slide, my theory proposed above was correct that it could be decoded with sophisticated software, and a skilled computer technician. Recently, my friend and colleague Paul Kimball released two videos on how the placard can be deciphered. Paul is part of a new team, that started a website called www.roswellslides.com and took the information presented here one step farther, and have claimed to have been able to decipher the placard that I proposed above could hold the true identify to what this being truly is. CAPTION: Tim Printy provides a demonstration of how easy it was to decipher the writing on the placard on the “Roswell slide”. Note that there is no manipulation of the image going on here other than an enhancement of the original – which in this case is the “drum scan” provided by slides promoter Adam Dew on his own website. CAPTION: Lance Moody provides a demonstration of how easy it was to decipher the writing on the placard on the “Roswell slide” using the simple process first initiated by Research Group member Nab Lator. Note that there is no manipulation of the image going on here other than an enhancement of the original – which in this case is the “drum scan” provided by slides promoter Adam Dew on his own website. This may be one of the final updates to this case file, simply because the information is overwhelming that this is either a) a hoax or b) a case of mistaken identity. But, the question is, why in the “years” of research was no one able to achieve what those on the internet did in just days? 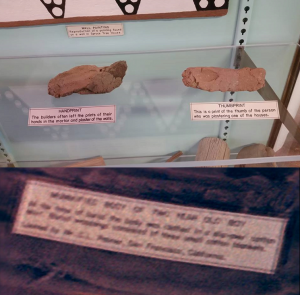 This is a comparison if the “Roswell Slide” and the present day Mesa Verde Museum. If you look at the shelving units used, they appear to be (with the exception of color) the exact same shelving unit. 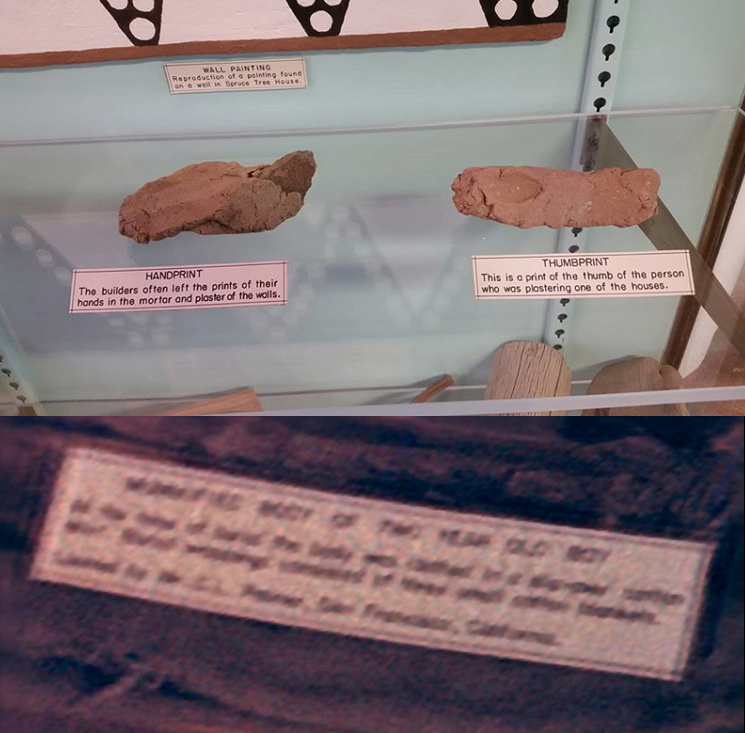 In this comparison, you can see the Mesa Verde Museum has an identical way of creating their placards. The title of the display, is in ALL CAPS, the writing appears nearly identical, and you can see a match on the black border around the placard. It would certainly appear to me, with the above information, that this case be closed. It would seem like I’ve been here before… Asking my friends and colleagues to accept my sincerest apology for my participation in the recent event in Mexico City. I accept full responsibility for the fact that I allowed myself to be drawn into this situation, albeit with the best of intentions, I sacrificed my better judgement by being overly trusting when I should have known better. As one strives to make up for the mistakes of the past, there are times that emotions cause one to outrun their headlights. In my case, I ran it right off the road. Through the years I have worked hard to earn back your respect and confidence in my work only to presently jeopardize it all. For that I am especially remorseful. I am afraid that after spending almost half of my life devoted to one specific investigation, I allowed the allure of final resolution cloud my skeptical nature to be replaced by a false vision of hope. I now realize that the image in the slides is a mummy as specified by the display placard. At this time I consider the matter concluded and intend on moving forward. My only desire is that you try to understand that I never willfully did anything to mislead or misrepresent what I thought was the truth and I only acted with the best of objectives. Still, if I have offended or hurt anyone through my participation in this event, you have my deepest apology and have every right to hold it against me. When the truth finally was made known to all of us, I realized that I could only blame myself for not only failing you, but more sadly, failing myself. I must do better. And with God’s help and your understanding, I promise I will. Pingback: O "Slide de Roswell” - Possível Fraude com Múmia de Museu?